The following recipe created quite a stir when “Moomie” first posted it on our online community. Baker after baker tried these buns and declared them THE BEST. Soft, vaguely sweet and golden-yellow from the butter and egg, these simple buns are perfect for burgers, but also fine for any kind of sandwich. For slightly smaller buns, divide the dough into 12 pieces instead of 8. Bake the buns for 12 to 15 minutes, instead of 15 to 18 minutes. And how about “slider buns” — about 3″ in diameter? Divide the dough into 24 pieces, and bake for 12 to 15 minutes. When making anything with yeast, including these rolls, let the dough rise to the point the recipe says it should, e.g., “Let the dough rise till it’s doubled in bulk.” Rising times are only a guide; there are so many variables in yeast baking (how you knead the dough; what kind of yeast you use) that it’s impossible to say that bread dough will ALWAYS double in bulk in a specific amount of time. What’s another easy way to shape buns, besides rolling them into balls and flattening? Gently deflate the dough, and form it into a smooth 8″ log. Slice the log as though you were slicing cinnamon buns. Gently pull each slice into a circle. Brushing buns with melted butter will give them a soft, light golden crust. Brushing with an egg-white wash (1 egg white beaten with 1/4 cup water) will give them a shinier, darker crust. For seeded buns, brush with the egg wash; it’ll make the seeds adhere. 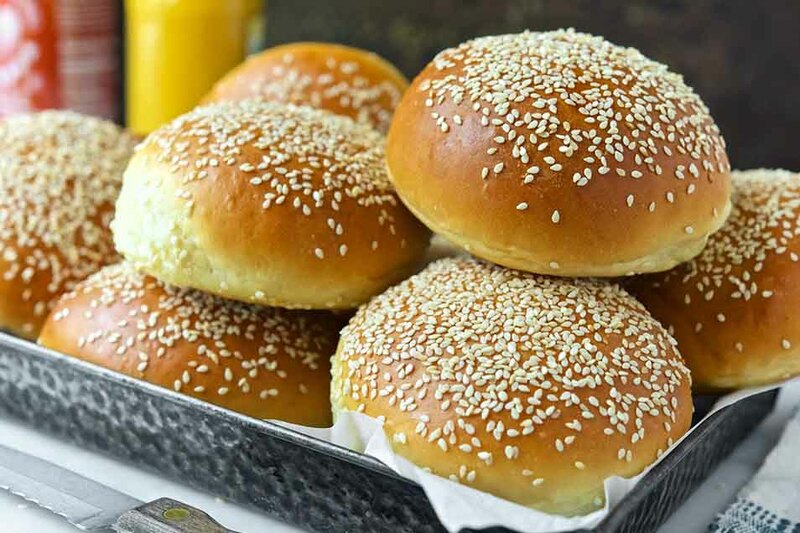 And, feel free to add the extra yolk to the dough, reserving the white for the wash.
To make these buns using our hamburger bun pan: Divide the dough into six pieces (if you have a kitchen scale each piece will weigh about 4 1/2 ounces), and shape them into balls. Place the balls into the lightly-greased wells of a hamburger bun pan, and gently press them with your hand to fill the bottom of the wells, or until they’re about 3 1/2″ to 4″ wide. Proceed with the recipe as written.